Contemporary artist’s impression of the Great Melbourne Telescope devised by Thomas Grubb. Elevation showing the latticework tube of the reflecting telescope and section of the masonry piers. A gentleman is shown to the left of the instrument as an indication of scale. 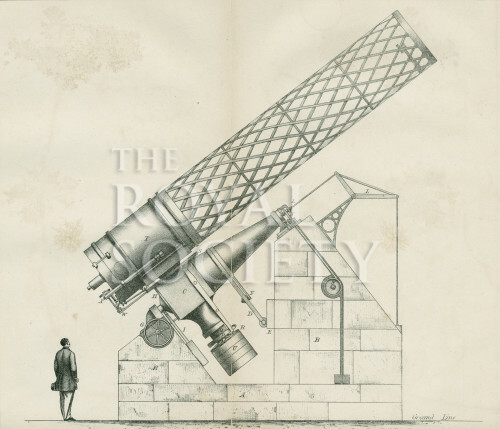 This version of Grubb’s design was reproduced in Correspondence concerning the Great Melbourne Telescope. In three parts: 1852-1870 (London, Royal Society, 1871), part I, plate 2 [between pages 26/27] and described in a letter of 29 April 1853, pp.23-28 with a key to the print.